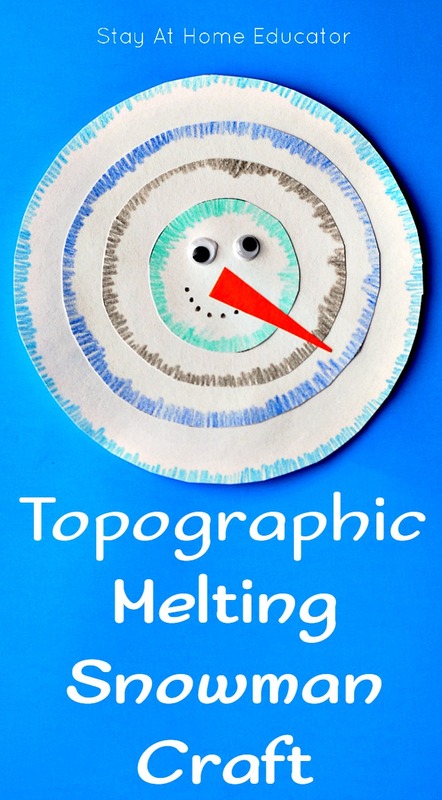 This topographic melting snowman is not only a super cute craft but also a fun way for preschoolers to practice sequencing size and a meaningful way for teachers to assess scissor cutting skills in their young students. This snowman craft was actually inspired by those super cute melting snowman cookies that are floating around Pinterest. I’ve never made them, and there are a couple of different versions out there, but this time of year my Pinterest thread gets infiltrated by silly melting snowmen. Because, you know, they are so cute and everybody adores them. But let me tell you a not-so-secret little secret. I won’t ever make those cookies. It’s just not my thing. Instead, I’ll use them as inspiration for a snowman craft that teaches size sequencing and assesses scissor skills for my preschoolers. I call this a “topographic” snowman because once assembled you can see they layers, which are in relief and remind me of a topographic map. 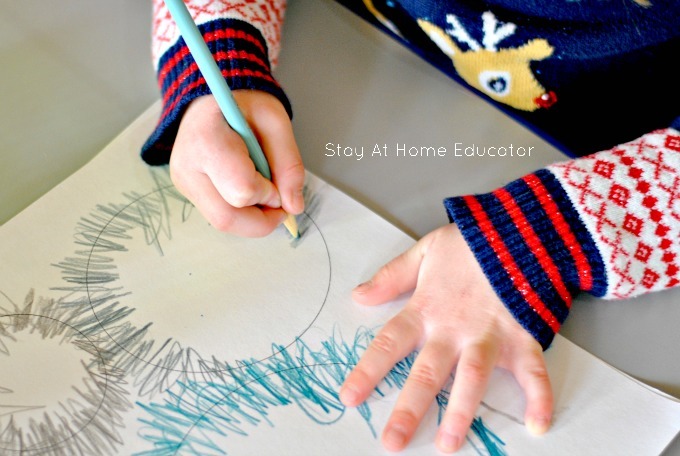 Invite your preschooler to color the over the circle outline using colored pencils. Coloring the entire circle is not necessary, only the outline. Order the circles so the largest is on the bottom and the smallest on the top. Glue (using a glue stick) in order. Use liquid glue to add googly eyes. Use a black colored pencil to draw in pieces of coal for the smile. Typically, when preschoolers are tasked with sequencing size, they show their skills be ordering various sized item in a line. In this craft, preschoolers can use trial and error to order their circles from biggest to smallest. Because the task is to stack the circles in order, it then becomes self-correcting. My goal is that all my preschoolers can cut a curved line by the end of the school year. 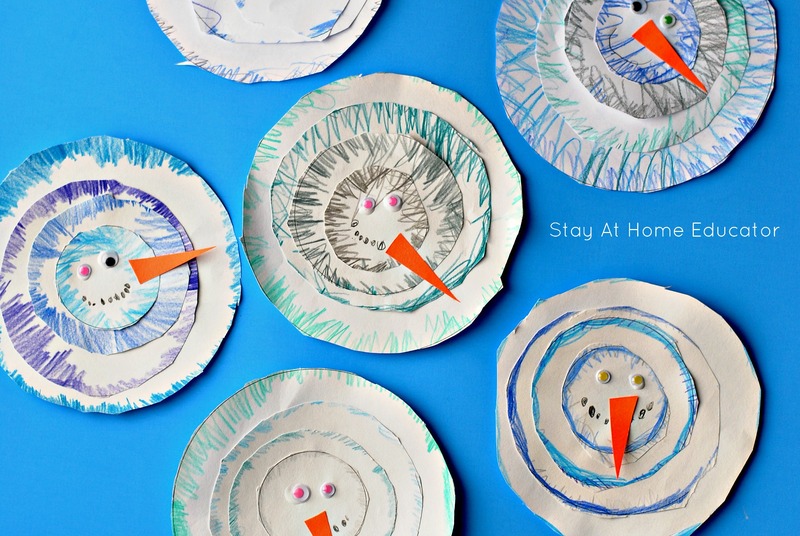 This snowman craft allows preschoolers to practice cutting several curved lines from their circles, which allows teachers a few opportunities to assess their cutting skills in a meaningful and authentic way. While this craft had step-by-step instructions for my preschoolers to follow, I love the diversity in the finished products. We hung them up as soon as the glue dried and will enjoy them throughout the rest of our winter theme preschool unit. 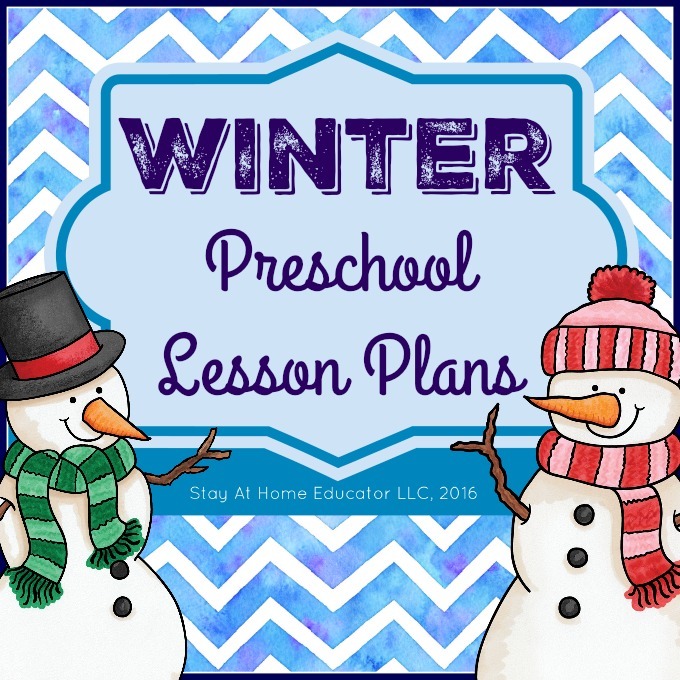 These topographic snowmen are just one of many fun, inviting and educational activities included in my winter theme preschool lesson plans. You can grab the rest here.